I'm not gonna lie, THIS WAS FUN!!! I was sent the beautiful Rue Romantique bezel KR102 Large Filigree Truss designed by Kristen Robinson, and asked to create a holiday ornament. Now as Carol said, I don't normally do bling. I immediately went to my bin of vintage jewelry looking for glitz and shimmer for this holiday festivity. 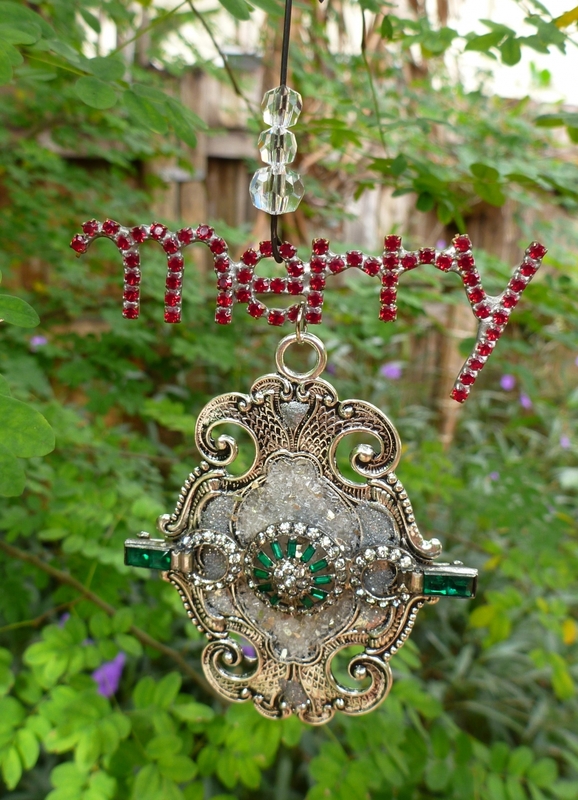 Wow, a red blinged "merry". I'll take it. A green rhinestone pin. I'll take that too! So you're asking, what did I actually do to make this ornament? Well, I used Iced enamels around the edges of the bezel and some glitter in the center held in with Ice Resin®. Then using wire and jump rings, I attached the vintage parts. I created the hook with wire and attached some Connie Crystals to finish it off. May your creative holiday juices flow! Gorgeous ornaments - love, love, love! For someone who doesn't do bling, you did a great job! You mastered the art of bling! Great ornament! This is absolutely stunning!! Simple yet elegant! TFS! This is fabulous... so sparkly and bight ...just perfect for a happy holiday hop! Jo, this is beautifully sparkly! Very pretty! !